Case IH’s Steiger and Magnum fuel-efficient tractors help growers maximise productivity and minimise costs. For a limited time, customers can take delivery of their new tractor now with payments deferred until February 2012. Growers looking to increase their efficiency and productivity as they gear up for winter sowing should consider upgrading their seeding tractor, according to Case IH Marketing Manager, Stuart Brown. “It’s incredibly important to have a tractor that’s powerful enough to haul your seeding rig at the right speed to get over your land quickly and consistently. To help growers get into a new, more powerful tractor for winter sowing, we’re offering a deferred tractor finance program that allows you to take delivery of your new tractor now and make no repayments until February 2012*. But you must be quick because this offer is only available for a limited time,” said Stuart. The APM system automatically adjusts engine speed and transmission ratio for maximum fuel efficiency and has demonstrated fuel savings from five per cent to 25 per cent (depending on the application). It achieves these savings by automatically adjusting the gear setting and engine RPM, based on ground speed and load. The engine throttle becomes a ground speed control lever while the APM system does the rest. When the external load increases, the engine RPMs increase to produce more power. When the external load decreases so do the engine RPMs; consequently the tractor consumes less fuel and produces reduced sound levels. 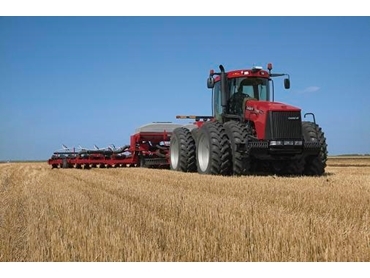 Case IH Steiger tractors are available in five models ranging from the 335 hp (250 kW) Steiger 335 to the 535 hp (399 kW) Steiger 535, while the Magnum is also available in five models, ranging from the 224 hp (165 kW) Magnum 215 to the 335 hp (246 kW) Magnum 335.